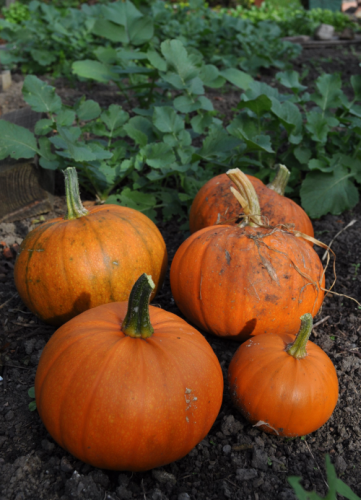 Monty Don (Gardeners’ World) suggested that it was time to harvest our pumpkins. They are not huge but should feed us for a few meals (the photo shows just a few of them). Our journey into “half farmer, half-X” is now a year old – if you measure it from the time of my redundancy and the realisation that there was such a thing – and it has been an exciting and interesting year. The most obvious thing to me is that I have been so much more relaxed. The stresses I had from travelling everyday and having to achieve other peoples targets have gone though I have found other stresses to put myself under. I’m probably fitter than I have been for a few years since I now cycle or walk to all my appointments, and I am working in areas that I have a passion. There is still the tendency to try and do too much of what I think I need or ought to do, and I still fail to see and take opportunities that arise. But I am having fewer regrets. Over all I think I have made a good decision (did I decide or was I pushed?) but time will tell. We still have so many challenges ahead and with the way the world is changing / not changing there could be many difficulties. One thing I will try to do is to do a bit more blogging. Not being an extrovert I find it difficult to get into the habit of regularly blogging but I have found it very helpful in reflecting on life. Maybe blogging will prove to be as fruitful, or more fruitful than our garden! This entry was posted in Garden, Half farmer, half X, Lifestyle. Bookmark the permalink.